Denver Botanic Gardens created the Chatfield Farms CSA (Community Supporting Agriculture) program in 2009 with a grant from Kaiser Permanente. Shares of the CSA are sold to members of the public who then receive portions of the garden’s fresh produce during the harvest season, from June through November. Portions of the harvest are also donated to local nonprofit organizations. Our produce is distributed to shareholders at two locations: Denver Botanic Gardens Chatfield Farms and Denver Botanic Gardens at York Street. At each distribution we feature items produced locally for sale throughout the season. It is our goal to offer our shareholders as many options as possible to source their food locally, as well as to support other small farms and processors. The CSA model directly links the consumer with the farmer, sharing the risk and reward of the season. Every season we have a group of working shareholders who get a reduced-price share in exchange for working a few hours a week through the season. 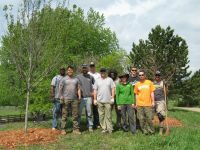 We are also expanding our Veterans Farm Program, providing opportunities for veterans to build job skills alongside staff and volunteers in a therapeutic natural setting. The CSA concept originated from ideas percolating in many locations throughout the world. In Japan, a group of women formed partnerships with local farmers to grow food for their immediate communities in order to avoid imported food, reduce pesticide use and preserve farm land from development. These relationships came to be known as "Tei Kei’s" or "food with the farmer’s face on it." The CSA model also arose from Europe and the principles of biodynamic agriculture and Rudolf Steiner. Followers of Steiner moved to the U.S., bringing the CSA concept with them. The first two American CSAs were started in New Hampshire and Massachusetts in the early 1980s, both of which are still active. There are now thousands of CSAs spread across the country.